"Your Board has been very active through May making use of different forums to advocate for reforms which they hope will result in an improved business environment for members. The Australian Ambassador recently hosted Brenton Mauriello and representatives from the AustCham Board along with representatives from the Board of Trade to a working dinner to discuss a range of topics including opportunities for expanding the current TAFTA provisions. Importantly, feedback provided by AustCham members in the January 2016 Services Survey was used to inform this discussion so your responses have had a direct impact. The Board will continue to pursue a number of advocacy goals in 2016 and will be meeting regularly with representatives from the Ministry of Commerce, Board of Trade and other agencies to lobby for members’ business interests. Member input is vital to this process. Thank you to those who participated in the second annual Business Survey last month – the results are currently being analysed in conjunction with the results from AustCham members across ASEAN and will be available shortly and put to good use supporting advocacy work. Nominations for the 2016 Australian Alumni Awards have recently closed with a record number of nominations received this year. A very impressive field of candidates are in the process of being shortlisted for interview and tickets for the event, which will be held at the St Regis Hotel on Thursday 23 June, can now be purchased on the AustCham website. Sponsored by the Australian Embassy Bangkok, Alumni Partner Blackmores and corporate sponsors Mitr Phol, dwp and Bumrungrad Hospital, the awards recognise excellence in professional achievement. This year special guest speakers will include the Australian Ambassador and Khun Pichai Chuensuksawadi, Editor-in-Chief of the Bangkok Post and Australian Alumnus. We encourage members to attend what should be an inspiring evening showcasing the strong links between Australia and Thailand. In related news, the Chamber Office will be hosting another university intern in June-July and we look forward to Khun Patcharamon (Bee) Prachakchit joining the team. Khun Bee is a student at Srinakharin University and will be working on Chamber Communications as well as assisting with events. June and July are historically big event months for the Chamber with the annual Commonwealth and Stars and Stripes Sundowner events. Building on the successful business and community events in May, the AustCham Tourism and Hospitality sub-Committee have also been busy securing speakers for a new series of monthly Hospitality Sector meetings which will run from July until the end of the year. Further details will be published soon. Finally, AustCham is proud to announce that AustCham Board member and Treasurer, Peter Emblin, has been appointed as the 45th Chartered Director of the Thai Institute of Directors (IOD). Peter is the second Australian to become a Chartered Director of the Thai IoD, after former AustCham President, John Hancock. Peter’s appointment makes Australians the most represented foreign nation in the number of Chartered Directors of the Thai Institute of Directors. Well done, Peter." 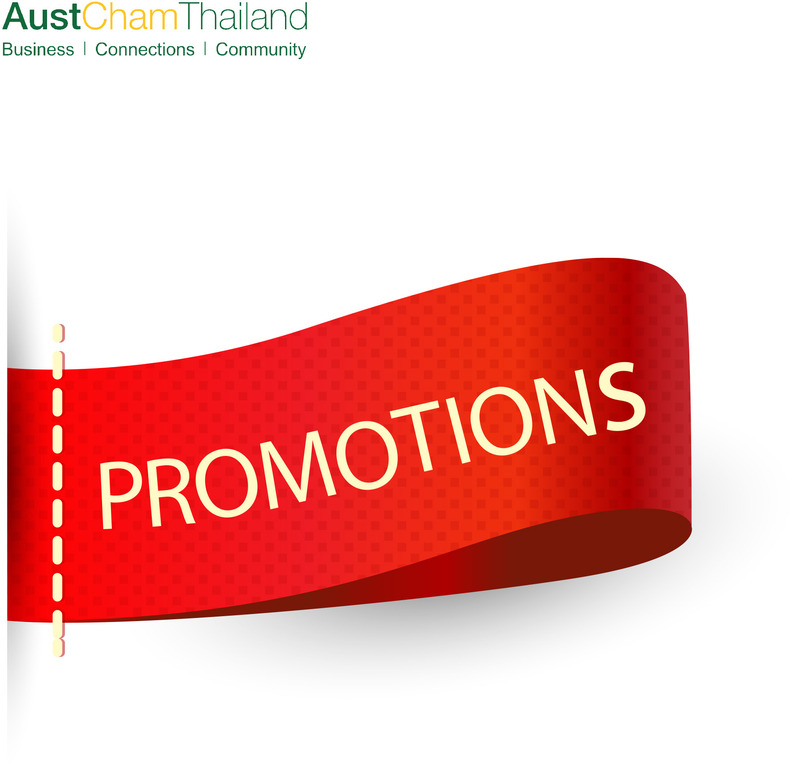 AustCham would like to invite members and guests to a Joint Chambers Eastern Seaboard Networking Evening hosted by Netherlands - Thai Chamber of Commerce (NTCC) and Canada - Thai Chamber of Commerce (CANCHAM) at Amari Pattaya. There will be a special update from the Prime Minister's Office on infrastructure project in the Eastern Seaboard Area at the event. AustCham Thailand in collaboration with the American, British, Belgium-Luxembourg, Canadian, French, Irish, Netherlands, Norwegian, Singapore, South African and Swiss Chambers of Commerce cordially invites you to a Multi Chambers Luncheon with Khun Kobkarn Wattanavrangkul, Thailand’s Minister of Tourism and Sports, organised by BCCT. AustCham is delighted to invite members and guests to join with counterparts from all Commonwealth nations at the 2016 June Commonwealth Sundowners. Sure to be a popular event, it will be hosted by the brand new Novotel Sukhumvit 20. Members from the British, Indian, Malaysian, New Zealand, Singapore, South African, Canadian, Ghana, Hong Kong, Nigeria, Pakistan and Sri Lanka-Thai Chambers of Commerce are invited to join this special event at member rates. AustCham is delighted to invite members and friends to join The 15th Volvo Truck & Bus Thailand Convoy for Kids Charity Golf. The event will be held at Laem Chabang International Country Club, Sri Racha. The annual golf day was started in 2002 to help raise funds for the Convoy for Kids charity. It has become one of the main events of the Thailand golf calendar. This year’s format will use 4 ball scramble and gives great value at Baht 4,500 per player. The price includes green fee, caddy fee, buggy, a quality Fenix shirt and cap with a total value of Baht 2,500 as well as an evening meal and beer during which the winners' trophies, technical and lucky draw prizes will be given away. Registration from 10.00 Hrs shotgun start at 12.30Hrs. The awards recognise the significant achievements of Alumni members who have graduated from any Australian University or other institution of higher learning and whose endeavours reflect the best of Australian education. Featuring speeches by H.E. Mr Paul Robilliard - Australian Ambassador to the Kingdom of Thailand and successful Australian Alumni Khun Pichai Chuensuksawadi, Editor in Chief, Bangkok Post. In a break from tradition, the 2016 Federal Budget was brought forward by a week, adding to speculation the Turnbull government will call an early election, which we now know will be on Saturday 2nd July. The budget therefore becomes the economic plan the government will take to the next election. As the election has now been called, it is unlikely any of the measures will be legislated before a new government is sworn in. So, now that the dust has settled a little, what did the budget have to say? Without a doubt, tourism is a significant growth industry,especially in the ASEAN region. However, the industry is particularly vulnerable to external forms of disaster that may strike any destination, at any time - be it a calamity of nature, technology, politics or economics. A destination's well-being and popularity can be severely affected, as ASEAN countries have experienced at one time or another. Asean connectivity is an integral part of building the Asean community. To achieve the Asean community, connectivity in terms of infrastructure, institutions and people interactions need to be strengthened, contributing towards a more competitive and resilient region, where peoples, goods, services and capital are brought closer together. Asean connectivity is working to improve the lives of Asean citizens by giving people more opportunities and boosting prosperity through enhanced economic and social development. Business Envoy is a new bi-monthly online publication that connects DFAT with business. It provides Australian business with a direct line to the Australian Government’s global diplomatic network, offering perspectives and insights on the economic and market impacts of geopolitical events and trends. Business Envoy draws on reporting and advice from Australian embassies and high commissions in key trade and investment markets, as well as analysis and assessments on international issues from DFAT in Canberra. Whilst the economic recession in Thailand has resulted in low growth for retailers over the past few years, recent figures indicate that more Thais are shopping online. The world’s international food and beverage buyers were attracted to the diverse range of food and beverage products showcased by over 150 Australia companies at Food and Hotel Asia (FHA) 2016. What you need to know about how the parties' policies stack up. AustCham President, Brenton Mauriello and Board Director, Panita Vongkusolkit, attended CREATING CITIES: Co-Create Charoenkrung, a public discussion held at River City Shopping Complex on Tuesday 17 May. With opening remarks provided by H.E. Mr Paul Robilliard, Australian Ambassador to the Kingdom of Thailand, the exchange shared the experiences of Marcus Westbury, founder of multi-award winning creative revitalisation projects “Renew Newcastle” and “Renew Australia”, Associate Professor Peeradorn Kaewlai from the Faculty of Architecture and Planning, Thammasat University and Mr Yossapon Boonsom, landscape architect and Director of Shma. The event was delivered in partnership with The Australian Embassy Bangkok, Bangkok River Partners, Creative District Foundation, River City Bangkok, Royal Orchid Sheraton Hotel & Towers, Thailand Creative & Design Center (TCDC) and and Thailand Specialty Coffee. AustCham proud to recognise the appointment of AustCham Board member and Treasurer, Peter Emblin, as the 45th Chartered Director of the Thai Institute of Directors (IOD). Peter is the second Australian to become a Chartered Director of the Thai IoD, after former AustCham President, John Hancock. Peter’s appointment makes Australians the most represented nation in the number of Chartered Directors after Thai’s. Well done, Peter. CPM is an award-winning international outsourced sales agency specialising in field marketing, contact centre and digital marketing solutions with a proven track record of increasing sales and brand awareness for our clients by using insight to create influence & drive sales. CPM is in the business of people. It is the essence of what we do - our DNA - delivering our clients brands to their customers through our people with outsourced sales and customer care teams trained specifically for every campaign. Arin is now working with his family business named Baimiang Trading Company Limited in Healthy Retail & Distribution industry. They are the Exclusive distributor of high quality organic and natural products importing from around the world such as Australia, New Zealand, France, Spain and United State. I am an experienced Delivery and Program Manager who has worked across the application and infrastructure landscape to deliver services predominantly to Federal and State governments within Australia.